Majestic Designs recently supplied a full house of windows and two entrance doors for a home improvement project in Weston-super-Mare. 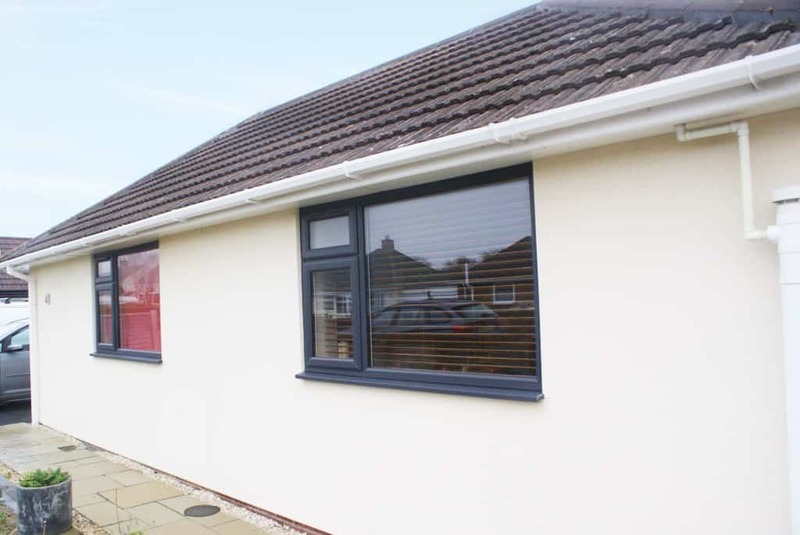 The double glazed products were the finishing touch to a large side extension which transformed this two bedroom bungalow into a spacious four bedroom property. With a recent new addition to the family, our clients decided it was time to increase their living area. As they were already happy and settled in their home, they decided to improve rather than move. The local Weston family chose Majestic Designs to supply the windows and doors because they’d heard of our excellent local reputation for quality products and outstanding customer service. 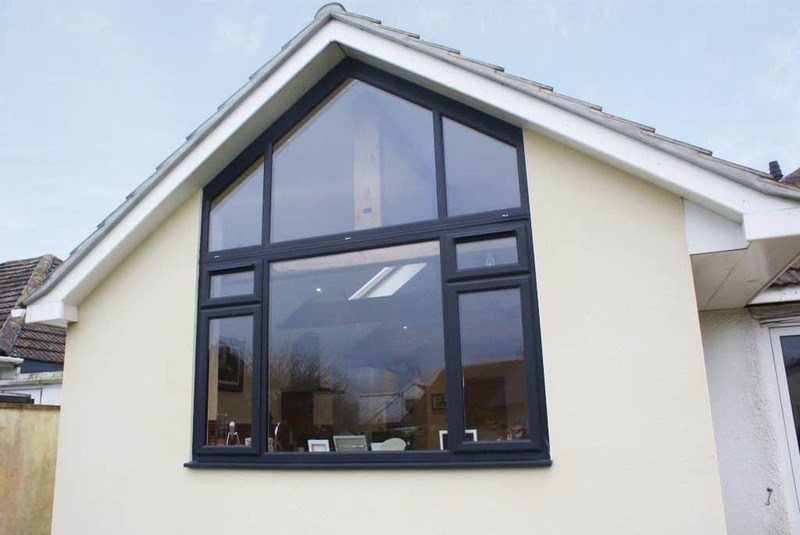 After discussing colour preferences with the client and what would best suit their home, they decided on dual colour frames with Anthracite Grey for the exterior and White inside. 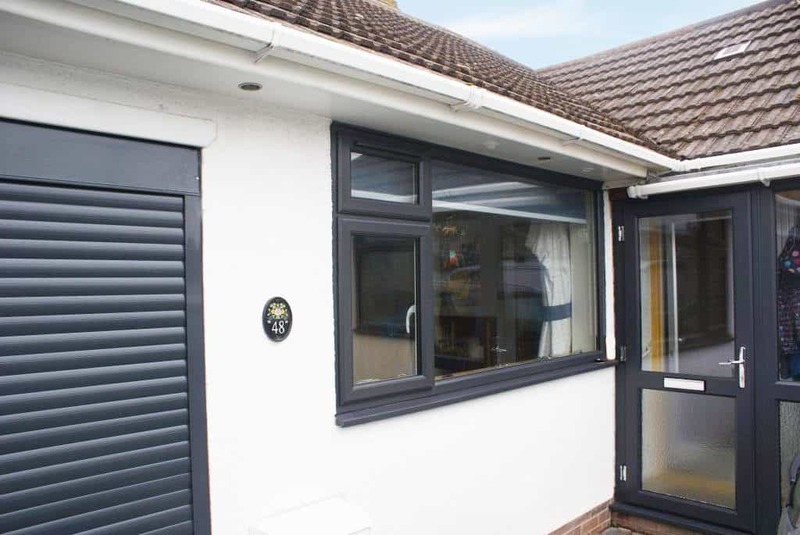 The Anthracite Grey exterior provides a stylish contemporary look which looks great against the newly rendered and freshly painted house walls. The main feature of the property is a large bespoke window whose top section runs along the gable line of the roof. At our Cheddar factories, our manufacturing team were confident in creating this large two section window which allows an abundance of natural light into the property. At Majestic Designs, we pride ourselves on the quality of our products, our excellent installation teams, and high manufacturing standards. All our teams are FENSA and MTC accredited so you know your home is in safe hands with us. All our windows and doors feature Diamant, Planitherm Total +, Argon filled double glazed units for the best in energy efficiency levels, giving a A+14 energy rating as standard. They are BBA tested to ensure excellent levels of weather resistance, security standards, and thermal and acoustic insulation capacity. Here at Majestic Designs, we aim to always meet the demands of each individual customer, and consistently exceed their expectations. Whether you are looking for a new back door, or you want a full scale conservatory, designed, manufactured, and installed by us; we can accommodate any request. We manufacture every one of our products in house to ensure high standards are maintained. For the best in the South West, contact Majestic Designs today. Call us on 01934 741 294 or send us a message online.